Today is a very important day in the history of our Nation and the Life of The Honorable Minister Louis Farrakhan. “In a tiny town in Mexico called Tepoztlán, there is a mountain on the top of which is the ruins of a temple dedicated to Quetzalcoatl—the Christ-figure of Central and South America; a mountain which I have climbed several times. However, on the night of September 17, 1985, I was carried up on that mountain, in a Vision-Like Experience, with a few friends of mine. As we reached the top of the mountain, a Wheel, or what you call an ‘unidentified flying object’, appeared at the side of the mountain and I was called from The Wheel, to come up into The Wheel. Three metal legs appeared from The Wheel, giving me the impression that it was going to land, but it never came over the mountain. Being somewhat afraid, I called to the members of my party to come with me, but a voice from The Wheel spoke saying, ‘Not them; just you.’ I was told to relax and a beam of light came from The Wheel and I was carried up on this beam of light into The Wheel. I sat next to the pilot, however, I could not see him—I could only feel his presence. 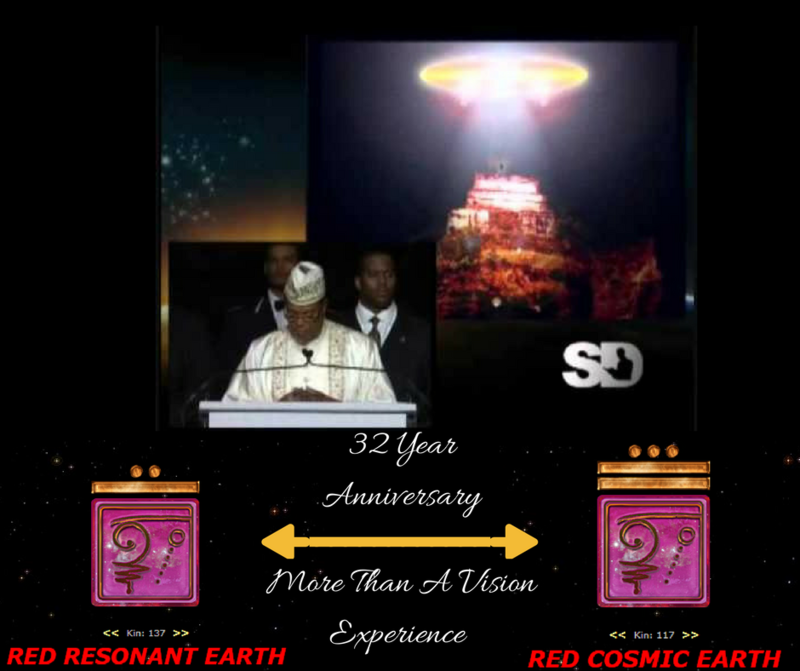 As The Wheel lifted off from the side of the mountain, moving at a terrific speed, I knew I was being transported to The Great Mother Wheel, or ‘The Mother Plane’, which is a human-built planet, a half-mile by a half-mile, which the Honorable Elijah Muhammad taught us of for over 60 years. The pilot, knowing that I was fearful of seeing this great, mechanical object in the sky, maneuvered his craft in such a way that I would not see The Mother Plane and then backed quickly into it and docked in a tunnel. I was escorted by the pilot to a door and admitted into a room. “I shall not bother you with a description of the room, but suffice it to say that at the center of the ceiling was a speaker, and through this speaker I heard the voice of the Honorable Elijah Muhammad speaking to me as clearly as you hear my voice this morning. He spoke in short cryptic sentences; and as he spoke, a scroll full of cursive writing rolled down in front of my eyes—but it was a projection of what was being written in my mind! As I attempted to read the cursive writing, which was in English, the scroll disappeared and the Honorable Elijah Muhammad began to speak to me again. He said, and I quote: ‘President Reagan has met with the Joint Chiefs of Staff to plan a war. 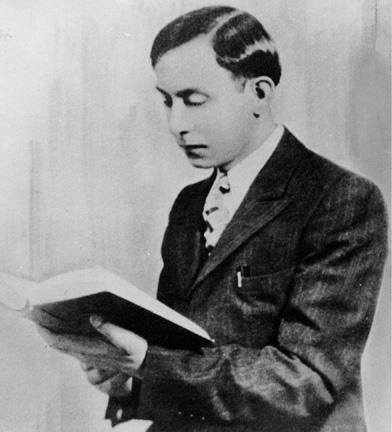 I want you to hold a press conference in Washington, D.C., and make known their plan—and say to the world that you got the information from me, Elijah Muhammad, on The Wheel.’ He said to me that he would not permit me to see him at that time; but he said that I had ‘one more thing to do’, and when that one more thing was done, I could come again to The Wheel, and I would be permitted to see him face to face. He then dismissed me; and I entered the small Wheel and the pilot—whom I still could not see—moved the craft out of the tunnel and took it up to a terrific height and maneuvered his craft that I might look down upon The Mother Wheel, and I saw a city in the sky. With great speed it brought me back to earth and dropped me off near Washington where I then proceeded into this city to make The Announcement. After I awakened that night, that Vision-Like Experience seemed to vanish from my mind. However, on the morning of September 19, 1985, a great earthquake struck Mexico City”—on the Richter scale it was “8.1”—“and it was felt as far away as Tepoztlán, the little town where I was staying. The earthquake eventually brought the vision forcibly to my mind; and I spoke it later that morning for the first time to my wife, Khadijah Farrakhan Muhammad, and to Sister (Mother) Tynnetta Muhammad, in the city of Cuernavaca, in Morales, Mexico. There are many in-depth articles on www.finalcall.com if you search for “more than a vision” via the search option. While doing the synchronicities of the time, I had some interesting discoveries. 13 and 7 and 20 in the law of time work are very potent numbers : 13 is the number of time, 20 is the number of totality. Synchronotron is a gauge of the passage of time based on the law of 13 and 7 coded into the harmonic standard 13:20/13:28. The passage of time refers to a system of communication by which the universe informs itself of different creative potentialities. While 7 is the universal frequency of creation, 13 is the frequency of time as the factor of universal synchronization. 13 and 7 create the synchronization programs of the universe resulting in a 13:20 frequency. We are in the 40th (20 plus 20) year of The Minister’s mission as of Gregorian Month September ( Moon 2 of the 13 moon Calendar). 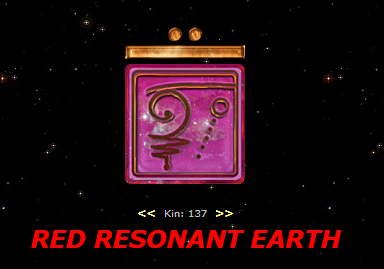 The Red Earth Seal is principally engaged with the energies of navigation, centeredness and alignment. These individuals are the problem solves and puzzle connectors of the planet. Red Earths act the junctures and sparking points of the cosmic flame of revolution and awakening. As keepers of the Earth’s precious vibration they hold many gifts and shamanic mysteries that can be of great benefit to themselves and others in awakening communities. 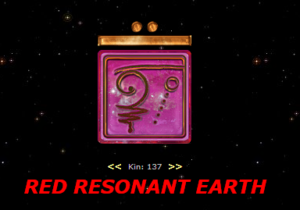 In their awakened state they have the potential to be supremely grounding and act as a living circuits of the earths interconnectedness and couriers of it’s divine plan. The seventh tone of resonant is a convergence and attunement to the present moment. Here the infinite and finite kiss together, forever birthing and billowing forth the reality which we call our lives. This tone is all about divine connection and remembrance. The merger and spiritual infusement of the true nature of things shines brightly into our self awareness. With this tone the waves and patterns of rhythm from the previous tone are seen to be timelessly present. In a sea of chaos pure divine resonance ushers forth as perfect knowledge and presence which has the power to realize the essence of all phenomena and self are one. 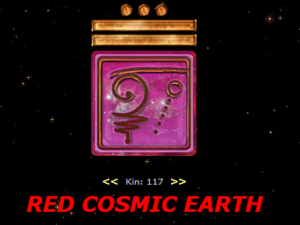 RED COSMIC EARTH. KIN 117. The thirteenth and final tone is Cosmic. This is place of re-entry into the infinte. Here a cycle of life has been made and lived through. The cosmic tone is all about transcendence and endurance. The presence of life and light bestows itself as all that is in existence. With the intelligence and zero point creative energy that the cosmic tone naturally holds new frontiers are felt coming forward in the distance of time. Coming forward to repeat and instate a whole new compendium of circumstances, lessons and pathways. This is truly the completion of the tonal nature of reality. 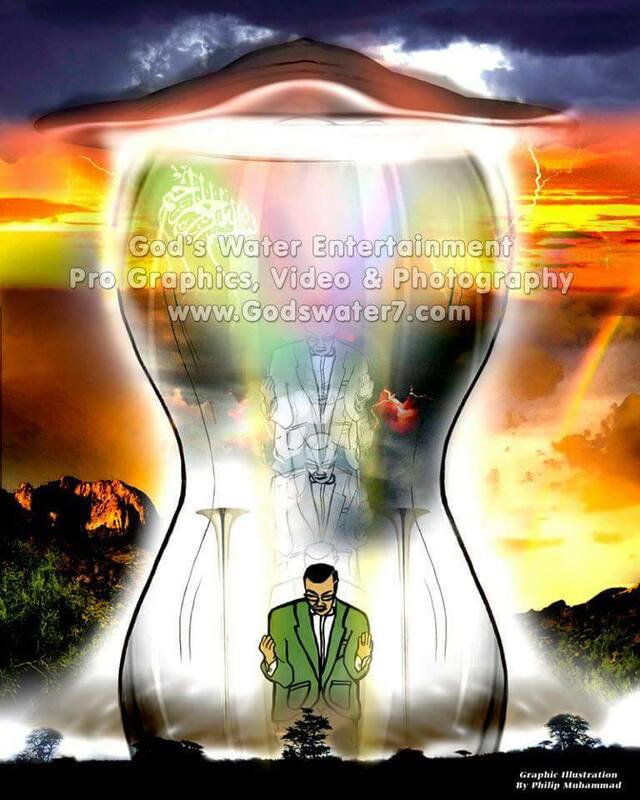 Please let us look at the journey of The Honorable Minister Louis Farrakhan and the tones for deeper understanding! May you be blessed with Universal Peace!